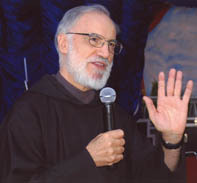 Long-time readers of this blog will know that I am a fan of the Papal Household Preacher and Capuchin Priest, Fr Raniero Cantalamessa, who models a truly authentic blending of Catholic Faith, Biblical teaching, Patristic scholarship, evangelical preaching and pentecostal experience. He was appointed "Preacher to the Papal Household" in 1980 by Pope John Paul II. His remit was renewed in 2005 by Pope Benedict XVI. Fr Cantalamessa is frequently invited to speak at international and ecumenical conferences and rallies. He is a member of the Catholic Delegation for the Dialogue with the Pentecostal Churches, and currently hosts a weekly program on Radiotelevisione Italiana. Here is the first of his homilies for Lent 2012, preached last Friday. In preparation for the Year of Faith proclaimed by the Holy Father Benedict XVI (Oct. 12, 2012-Nov. 24, 2013), the four homilies of Lent are intended to give impetus and give back freshness to our belief through a renewed contact with the "giants of the faith" of the past. Hence the title, taken from the Letter to the Hebrews, given to the whole series: "Remember your leaders. Imitate their faith" (Hebrews13:7). We will put ourselves each time in the school of one of the four great Doctors of the Eastern Church - Athanasius, Basil, Gregory of Nazianzen and Gregory of Nyssa - to see what each one of them says to us today, in regard to the dogma of which he was champion, that is, respectively, the divinity of Christ, the Holy Spirit, the Trinity, knowledge of God. At another time, God willing, we will do the same for the great Doctors of the Western Church: Augustine, Ambrose and Leo the Great. What we wish to learn from the Fathers is not so much how to proclaim the faith to the world, namely, evangelization, or how to defend the faith against errors, namely, orthodoxy; but, rather, how to deepen our faith, to rediscover, behind them, the richness, beauty and happiness of believing, to pass, as Paul says, "through faith for faith" (Romans 1:17), from a believed faith to a lived faith. It will spell, in fact, growth in the "volume" of faith within the Church, which will then constitute the major strength of its proclamation to the world and the best defense of its orthodoxy. Father de Lubac affirmed that there was never a renewal of the Church in history which was not also a return to the Fathers. Vatican II, whose 50th anniversary we are about to celebrate, is no exception. It is interwoven with quotations from the Fathers; many of its protagonists were Patristic scholars. After Scripture, the Fathers constitute the second layer of soil on which theology, liturgy, biblical exegesis and the whole spirituality of the Church rest and draw their lymph.